If you want to learn how to say some of the upper body parts in Italian (parti superiori del corpo) you are in the right place. 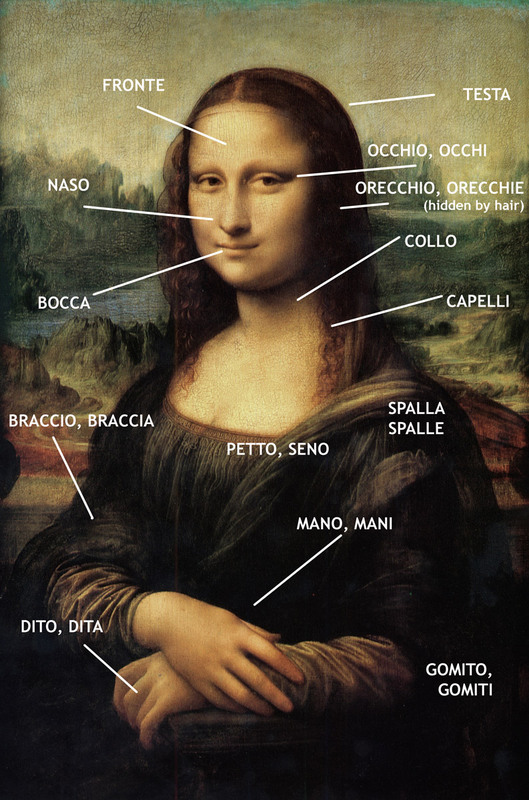 I took as a reference the famous Mona Lisa painting by Leonardo Da Vinci to show you the different upper body parts. In order to help you, I also attached an audio file (you can find it below the picture) in which you can hear the Italian pronunciation of each part. Head = la testa (feminine). Eye = l’occhio/gli occhi (both masculine). Even if they are hidden by hair Mona Lisa must have ears somewhere. Ear = l’ orecchio (masculine)/ le orecchie (feminine). Neck is il collo (masculine). Hair is i capelli (masculine). A single hair is capello, but normally we say capelli. For example: “Che bei capelli!” (What a beautiful hair). Shoulder is la spalla/le spalle (both feminine). Chest is il petto, breast is il seno (both masculine). Hand is la mano/le mani (both feminine). Finger is il dito (masculine)/le dita (feminine). Arm is il braccio (masculine)/le braccia (feminine). Mouth is la bocca (feminine). Nose is il naso (masculine). Forhead is la fronte (feminine). Chin = il mento (masculine). Cheek = la guancia/le guance (both feminine). Eyebrows = le sopracciglia (plural feminine). Now, if you want you can play the audio file to hear the correct pronunciation of the upper body parts in Italian. I know, the file is a bit long but I had many things to tell you. I hope you will be patient and listen. Enjoy and practice!